Founded by the Costa family in 1971, Costa Coffee has been voted the nation’s favourite coffee shop for three years running. Their main aim is to deliver the perfect cup of coffee to their customers, which is why they make sure that all of the coffee beans that they use are 100% certified by the Rainforest Alliance. Costa use Coffea Arabica and Coffea Robusta varieties, which after picking, are shipped to Costa’s roastery in London, where they have plenty of experience in roasting coffee after doing it for forty years. There, their ‘coffee superhero’ Gennaro Pelliccia is tasked with the important responsibility of tasting every batch of coffee to make sure that it’s perfect to serve to you! At Costa, they’re not only passionate about coffee, but they’re also dedicated to improving coffee-growing communities around the world, too. In 2006, the company set up the Costa Foundation, a charity which helps workers in coffee-growing communities around the world get better access to education for improving their basic skills, health, and managing their money. So far, the Foundation has built forty new schools for children and teens around the world, with no plans to stop. 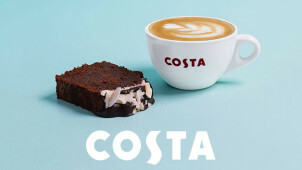 Along with coffee, Costa also offer a range of tasty meals, treats and snacks such as sandwiches, cakes and paninis that you can order with your coffee using our best offers. And, don’t forget to sign up to the Coffee Club beforehand so you can collect rewards, too. How do I use my Costa voucher? They'll add your discount to your order, and you can enjoy your coffee and little bit more for paying a little less! If you want an inexpensive pick-me-up in the morning, then look no further than Costa’s signature shot of espresso. Made with rich, strong coffee to give you the boost that you need, the shots are priced at under £2 making them the perfect, affordable morning drink to get your energy levels raised and ready for the day! Does Costa offer non-dairy milk alternative? Yes! Alternatives to milk such as soya milk are available – simply ask your Barista when you order and they'll add soya milk to your order. How do I get free Costa points? By signing up to the Costa Coffee Club, you'll receive 100 bonus points straight off the bat! Otherwise, you'll have to look out for offers to gain extra points on your food and coffee orders. Do Costa Coffee sell gift vouchers? Got a friend you simply can't function without their regular dose of caffeine? Coffee-lovers will be delighted with a Costa Coffee gift voucher. Just pop into your local cafe to pick up a physical gift card, or send an eGift online to brighten their day. Opening times will vary depending on the individual coffee shop. The best way to discover the opening times for your local Costa Coffee is to use the Location Finder tool on their website. Certain Costa Coffee stores in airports are open 24 hours a day! Get in touch using their contact form here. Costa is one of the biggest coffee shop chains in the UK, and from creamy cappuccinos to lattes, espresso, iced tea and lattes, there’s sure to be something on the menu that will put a spring in your step! Save on your hot drink of choice with Costa vouchers, and experience affordable coffee excellence. With a top range of teas, juices and bottled drinks, Costa is the perfect pit-stop for refreshment on your local high-street. How do I use my Costa vouchers? As the nation’s favourite coffee shop, it’s no surprise that Costa also has a Coffee Club for their customers to join. When you’re a member, you can swipe your card or use the app, which is available for iOS or Android, to collect bonuses, free Costa points and rewards every time you drink a Costa coffee – it’s as easy as that! For an even fresher take on your cup of Costa coffee, why not enjoy your favourite coffee made up with coconut milk instead? Naturally free from dairy and sure to give your coffee a sweet, nutty kick too, Costa offers will let you save on coconut vanilla lattes, coconut mochas and more! So whether you're going vegan or simply fancy a change, you can go for coco with Costa.